Kelly Partners Group (ASX: KPG) is a chartered accounting firm established in 2006. The company serves private SMEs via a network of 16 operating businesses. Kelly+Partners provide accounting, taxation, audit and wealth management services to over 5,300 client groups. KPG’s network of businesses includes 15 throughout Greater Sydney and 1 in Hong Kong. Among these, 3 specialist businesses advise on tax consulting, wealth management, and business strategy. The company has a controlling interest in all but 1 of the businesses. In 2016, the Australian accounting industry recorded $20bn in revenue. While revenue in the tax and compliance sector is considered stable, the industry’s structure is highly fragmented. There are a significant number of providers offering a broad set of services, while smaller practices often lack a succession plan. According to KPG’s management, the industry may be categorised into 4 segments (Figure 1). Kelly+Partners operate within the largest of these segments. Its target clients, SMEs, grew in volume by 2.4% p.a. from FY12 to FY16. By the end of 2015, SMEs represented 97% of all Australian businesses. In terms of annual tax compliance, $34bn is spent by individuals, SMEs and SMSFs. This represents 89% of the industry’s total tax compliance expenses. Senior management for KPG estimate SMEs have an average tenure with service providers of 10+ years, more than double that of large companies – including the “Big 4”. 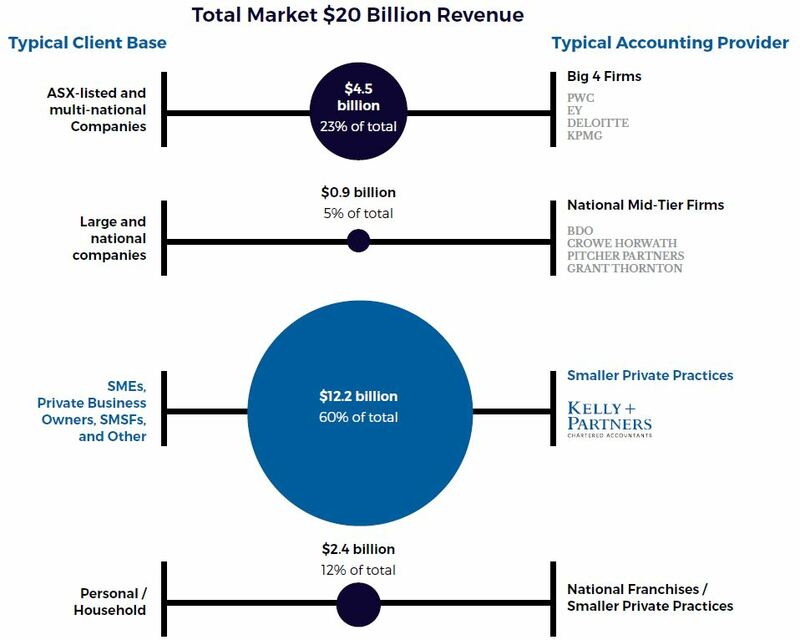 Peers in the same sector are considered to have: small client bases, limited expertise, 1 office, and under $2m revenue p.a. The increasing complexity of Australia’s taxation system has also been cited as an industry trend. Tax law volumes have grown from a little over 1,000 pages in 1951, to topping 15,000 pages. Furthermore, The World Bank recently reported Australia lags the likes of Canada, New Zealand, Singapore, China, the UK and several others when it comes to the ease with which a medium size business may pay taxes. 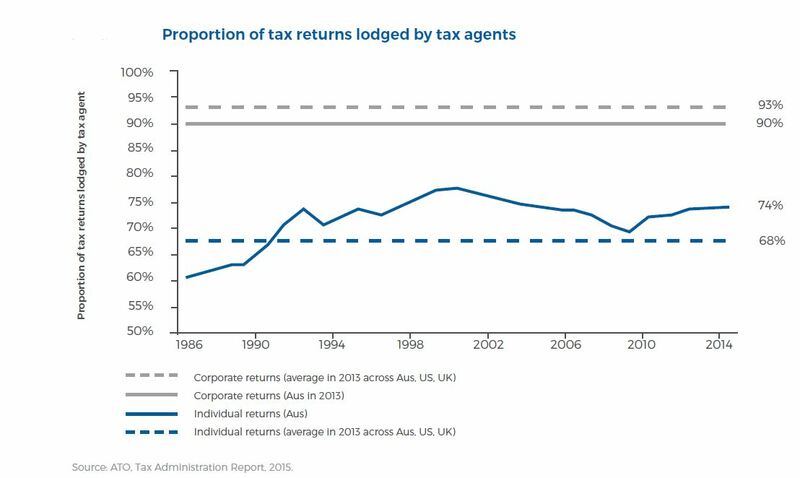 Kelly Partners believe the above factors have contributed to the increasing dependence on tax agents to manage tax returns (Figure 2). 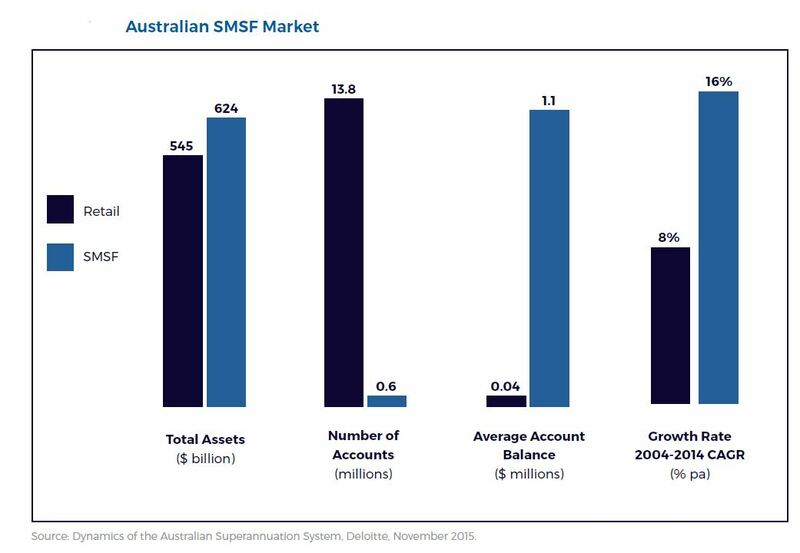 Figure 3 depicts the size of the total SMSF market. Kelly Partners Group engage with over 1,000 SMSF accounts with a combined asset value of $1.5bn. The IPO, underwritten by Morgans, is valued at $7.3m. This includes 2.88m new shares, and 4.46m existing shares being sold by current shareholders – all priced at $1 each. Funds are being raised to pay down debt and “provide greater financial flexibility”. Kelly Partners operate an owner-driven business model to retain and align the interests of its operating business owners, while also leveraging scale. Businesses are typically run as partnerships, with KPG holding a controlling interest (Figure 5). The provision of these terms are intended to lower overheads, optimise efficiency, recruit the best personnel, and provide a diverse range of services. KPG’s management also argue these aspects afford the businesses an offering that improves clients’ experiences, and results in increased cashflow and revenue growth. As the controlling business, Kelly Partners Group receive income through equity distributions in each operating business, management services fees (for centralised functions), and IP fees (for access). Fees are paid monthly based on a fixed percentage of each operating business’ revenue. The company’s consolidated revenue is predominantly via accounting and taxation services (85%), deemed predictable, recurring and which offer a premium price. Clients are charged a fixed fee, or according to time and materials. Average churn among clients is currently 2% p.a. KPG’s top 20 clients account for 16% of total pro-forma revenue (FY17). As well as a unified brand and central technology platform, KPG hold intellectual property in the form of an ‘Integrated Client Advice Model’, and a ‘Flight Plan’. The former consists of the company’s validated processes which “assess and optimise the financial management” of clients. The latter is a planning framework for SMEs to pursue financial objectives. Apart from Kelly+Partners Central Coast, where KPG own a majority stake in the property, all businesses operate under leases between 3-8 years. For their services, senior management received a combined total of 453,000 shares before the IPO. These shares are in addition to their previous holdings. 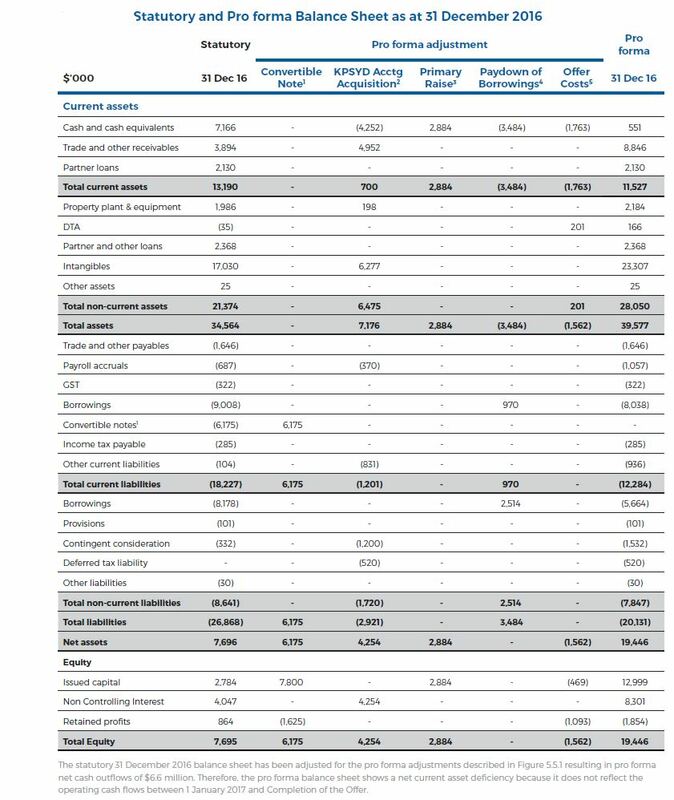 The company’s capital structure before and after the IPO is shown below, as well as the leading shareholders. No options have been issued. Kelly Partners issued a $6.5m convertible note to Ellerston, who converted it into shares in KPG. Escrow arrangements prevent Ellerston from selling 30% of its holdings within 6 months, unless the price exceeds $1.40 or a profit downgrade is announced. The 453,000 shares received by senior management remain in escrow until 1 month after KPG’s 1H18 results. Other restricted shares cannot be traded until 1 month after Kelly Partners FY18 results. Figure 8 shows escrowed parties. 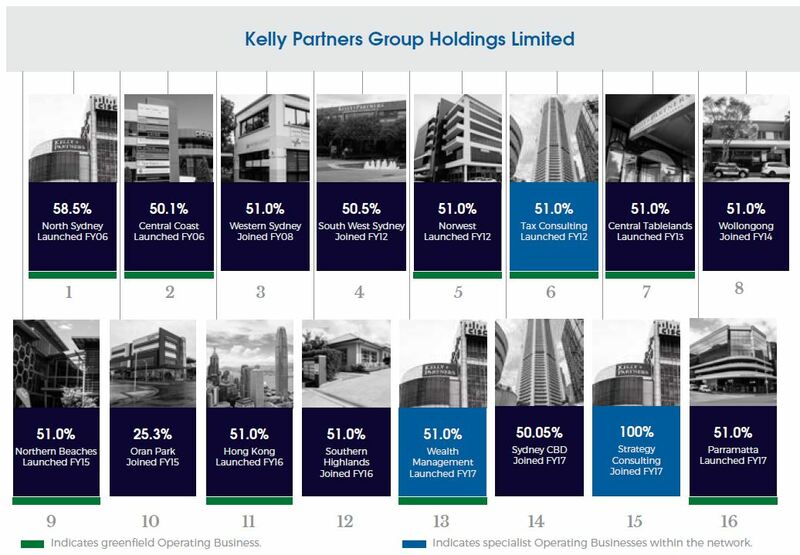 In the 10 years since Kelly Partners was formed, there has been a CAGR of 37% in consolidated revenue. 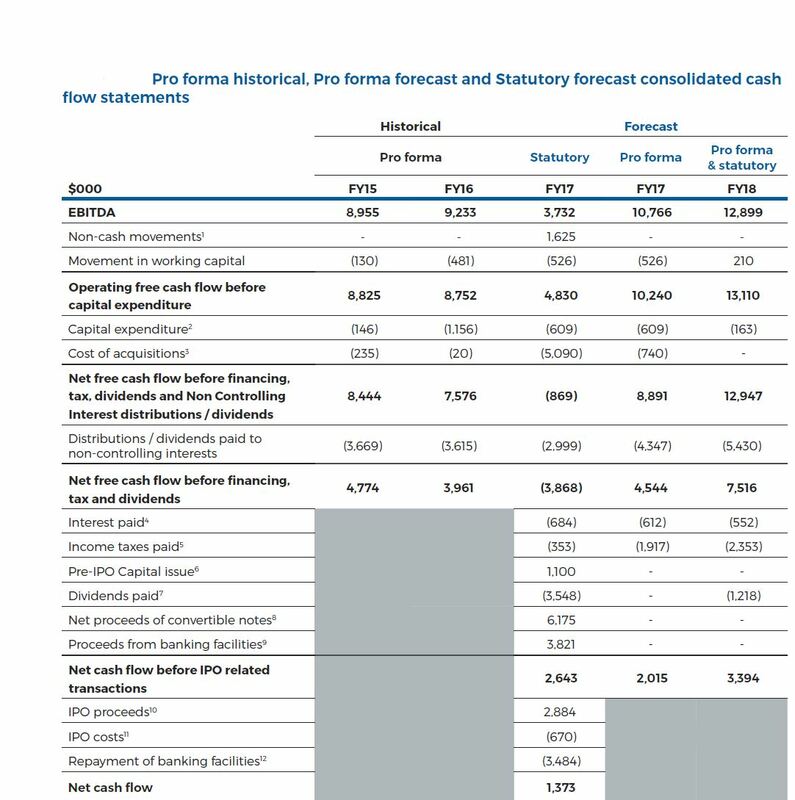 For FY17, the Directors have forecast a 10.9% increase in pro-forma revenue from FY16, to $34.62m. 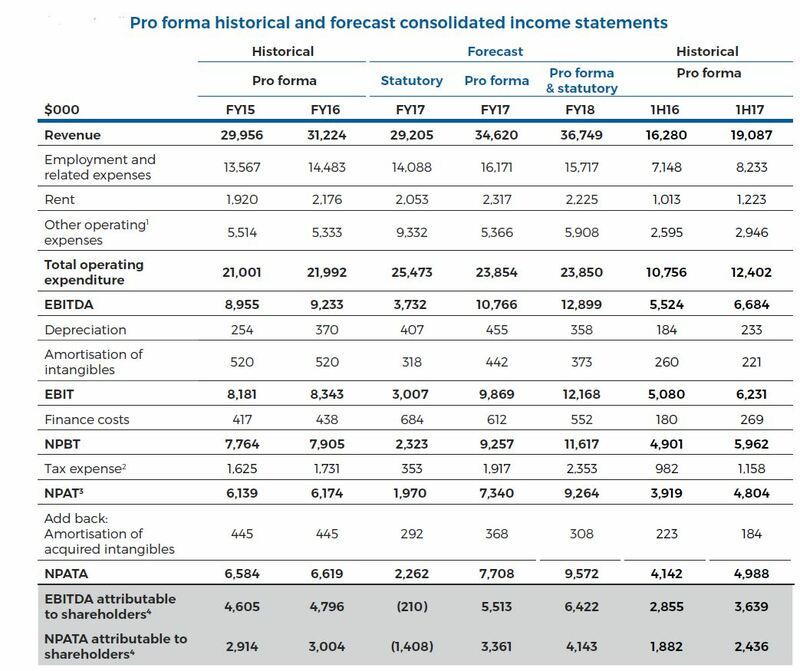 EBITDA is forecast to rise 16.6% across the same period. Mature operating businesses have been set a goal of 5% revenue growth per year. All operating businesses are targeting EBITDA margins of at least 32.5% (11.5% higher than the estimated average for the accounting industry). The offer price of $1 per share represents a PE ratio of 10.9 x FY18 earnings. A target dividend payout ratio of 50% has been nominated by the Directors based on Kelly Partners statutory NPAT. Payments are intended to be made quarterly, with the first expected to be declared in relation to Q3 2017. The following financial statements do not include explanatory notes or adjustment breakdowns. Refer to the prospectus for the relevant details and assumptions. Acquisitions: Integrating new businesses could overburden management and resources, leading to oversights. Synergies may not eventuate. Purchase prices, costs, and disruption could be higher than anticipated. Financing: Further funds may be required for development, with no guarantee over the terms. Default risk is borne by KPG’s subsidiary. Operational and Technology: Disruptions to systems, services and the like can impede business. Inadequate leases could be detrimental to profits.